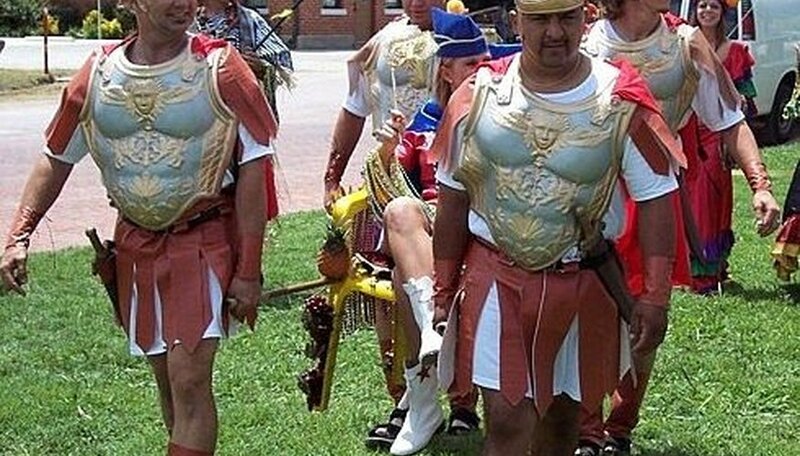 I was planning a special event that called upon 4 stout roman soldiers to carry a beauty queen around on a throne. My budget didn't allow for the rental of 4 adult roman soldier costumes. So this is how I did it. To get maximum effect while putting minimal amount of money into the costume your going to have to put in some sweat equity. Find a good costume shop locally or online and buy the cheap plastic helmet and chest armor. as I recall I was able to outfit each soldier with his armor for less than 15 bucks. Now comes the artistic effort. Spruce up the helmet by adding your own plume. the original centurions would have had lion mane for a helmet accent but you can get along fine with colored pipe cleaners or faux feathers. Just hot glue them on to the store-bought helmet. You will probably also need to beef up the helmets strapping system. Mine came with those decapitatingly-thin strings. use faux leather to make a proper strap. Your undergarment will be an oversized T-shirt. make sure it hangs mid thigh. The store bought chest plate needs some help. Make a short cape out of the cheapest red material (try to match your helmet plume)you can find. The shoulder decorations serve to hide the t-shirt look of the t-shirt. secure both to the chest plate itself so that your soldier puts it on as one piece. Your leather skirt, arm-bands and shin-guards will be made of faux leather. It is easy to find in any half rate fabric store and is cheap. The stuff I got had a cottonish fuzz on the back. Cut your skirt to fit the wearer and slice places for a cheap leather belt to thread thru it. close the skirt up by sewing or velcroing. Velcro is best for the wrist bands and shin-guards as well. you want it to be easy to get on and off. The flip flops or cheap sandals are hidden somewhat by the shin-guards. get your oversized shirts, "leather" belts and flip flops at Walmart or a dollar store. its important for the look of continuity that you get the same for all your soldiers don't go cheap and try to build the helmet or chest armor. both would require lots of work and not look as good. its the mix of homemade and store bought that make this uniform.